I woke up early on Saturday August 11th with a mission. 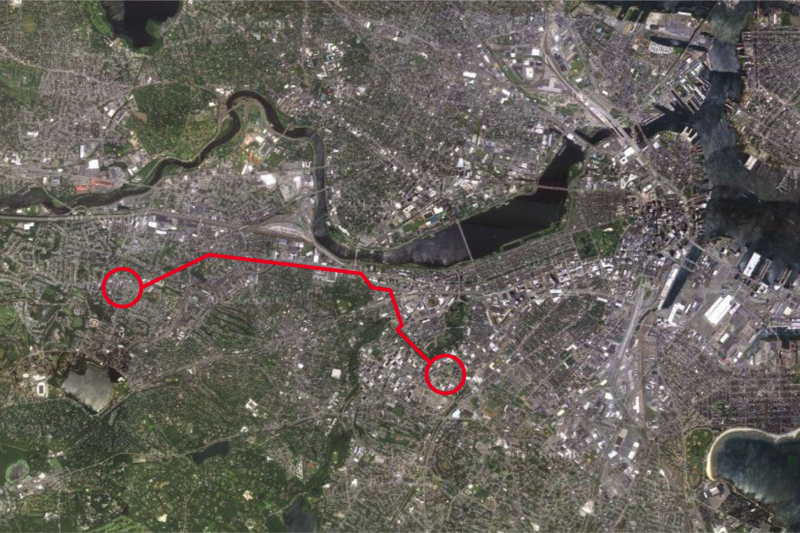 I was going to ride my bike across the city to explore and document two of Boston’s newest architectural additions. One a recently completed Massachusetts College of Art high-rise dormitory designed by architecture firm ADD Inc; the other a massive street art mural by Brazilian brothers Os Gemeos, completed in conjunction with an exhibition of their work at the Institute of Contemporary Art (ICA). I did not check the weather because I never do. It was the most humid day of my life. I had been keeping an eye on the new Mass Art dorm for some time. I first heard of its pending construction in the fall of 2010 and was instantly intrigued. You see, Mass Art along with Wentworth Institute of Technology (my alma mater) are two of several separate colleges that make up an alliance of schools known as The Colleges of the Fenway. These colleges share facilities and associated students are free to enroll in classes across the consortium. Wentworth and Mass Art are particularly close in regard to their physical location. Mass Art’s main campus and main academic building were directly across the street from my freshman dorm and during that time there was already one dormitory on what was once Wentworth property. 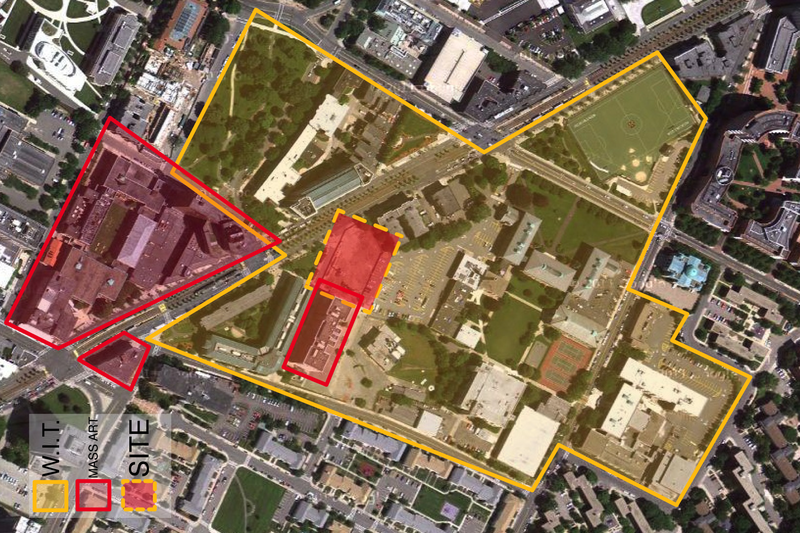 Essentially The Mass Art campus and the Wentworth campus overlap and looking back now I don’t really distinguish them; in fact it is the reason why I think I found myself having such a personal stake in Mass Art’s new dormitory. I began to do research on the building, I read through the architects’ website, saw renderings, read forum threads, and once the steel began to go up, I would swing by the site to get a quick glimpse at the progress. Everything I saw confirmed and elevated my excitement; this was no ordinary building. There was no doubt it was going to stand out (How could it not? It was going to be three times the height of anything else in the area.) But more importantly, you could tell the design team, including the client, understood the importance of creating something that would not only reflect the values of Mass Art (the nation’s only publicly funded Art school) but would be an energizing if not inspirational element to the student population which inhabits the Fenway neighborhood ¾ of the year. I waited patiently for its construction to be complete. A couple of weeks prior to what would become my epically moist bike ride I saw the final landscaping being completed, this perfectly coincided with the beginning of the fall semester and I knew then that I had only a short time to check out the building before hoards of students descended on campus like the locusts in Revelations. It was then I came up with my brilliant idea to make an adventure out of it – ride my bike through the city and to combine my Mass Art visit with that of the newly completed Os Gemeos mural. I left early on Saturday mourning from Brighton Center and made my way towards Wentworth. When I arrived this is what I found. 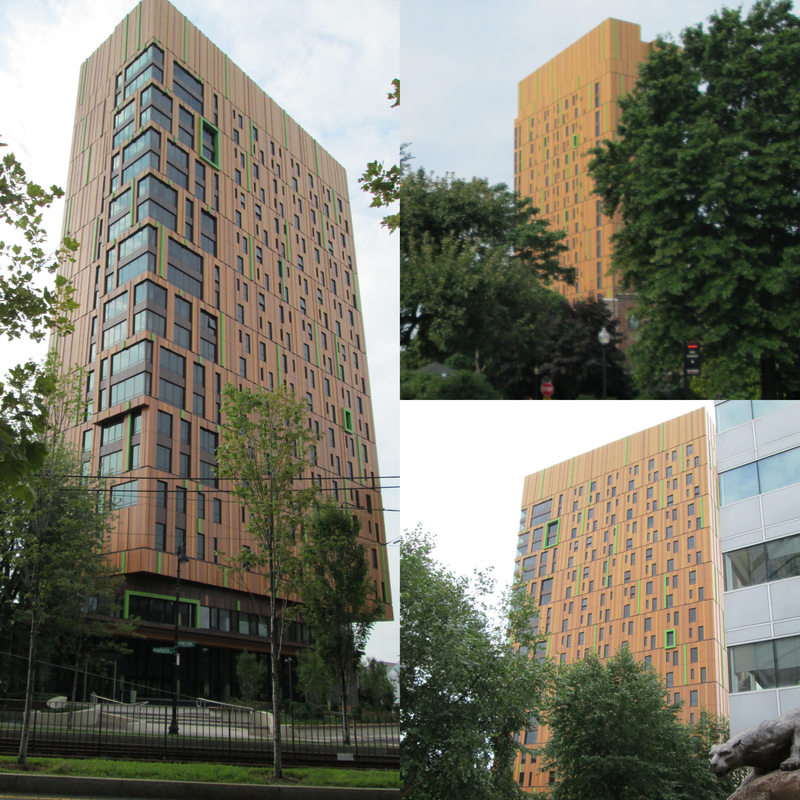 Though the new dorm towers above its neighboring buildings, it fits in well at ground level. 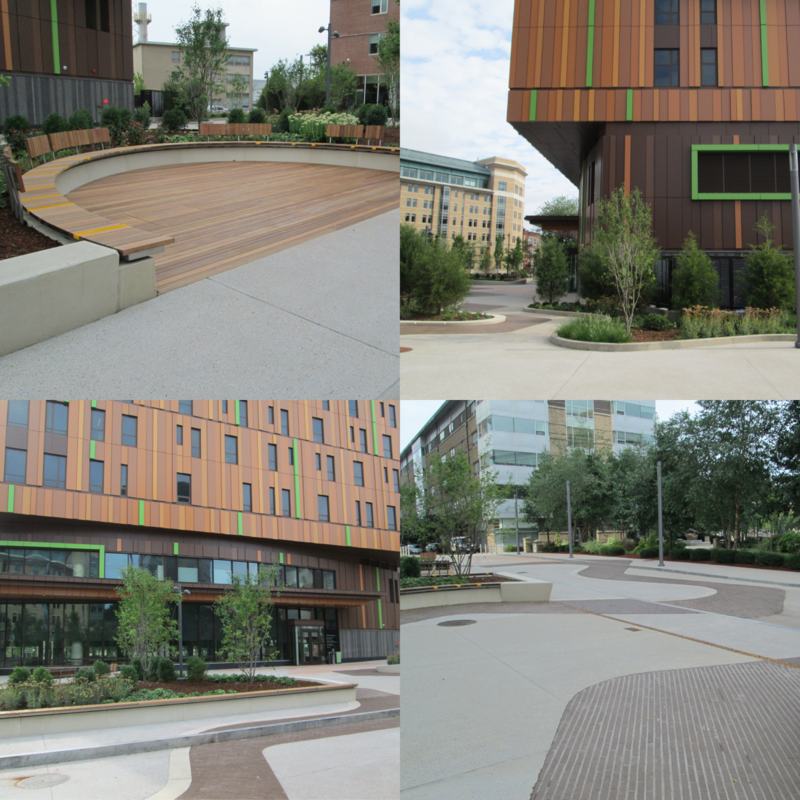 The landscape design transformed what used to be an access road into a legitimate plaza. At its base the tower curves inward, subtracting from the rectangle that rises above. The plaza combined with the minimized base it sits on separates the building into two scales: one, a human and inviting scale, the other a mass at the scale of the city. Recognizing the need to design for two different scales was smart and an important element when it comes to tall buildings. I find that sometimes, like walking down the streets of Manhattan, a person can begin feel like an ant trapped in a steel canyon because there is an absence of human scale. The Mass Art dorm has managed to avoid this problem for the most part. In the back however, where there building abuts a Wentworth parking lot, the designers did not bother to separate the scales (other than a change in material / color) and as a result the mass becomes a bit overwhelming. Aside from the plaza, the façade of the building is the most successful aspect of the design. Essentially the building is an extruded rectangle, which isn’t unique, but it is with the façade that the designers were able to express their creativity. It is (from best I can tell) made up of a series of metal panels of various colors, widths and thicknesses. The color is nice; it is certainly unique and will stand out especially with the green accents, but what I was really taken by was the introduction of varying panel thicknesses. Personally I have been exploring this idea for some time. Essentially all buildings need a cladding of some sort whether it is wood siding, bricks, concrete or metal panels. Though for so long this cladding was two dimensional, flat. Late in school I began to think about extruding cladding in an effort to introduce the third dimension. It began by accident with a model I built for a completely different purpose and continued with a model I built for myself while I was bored and unemployed. Needless to say I was amped to see somebody applying the idea in the real world. 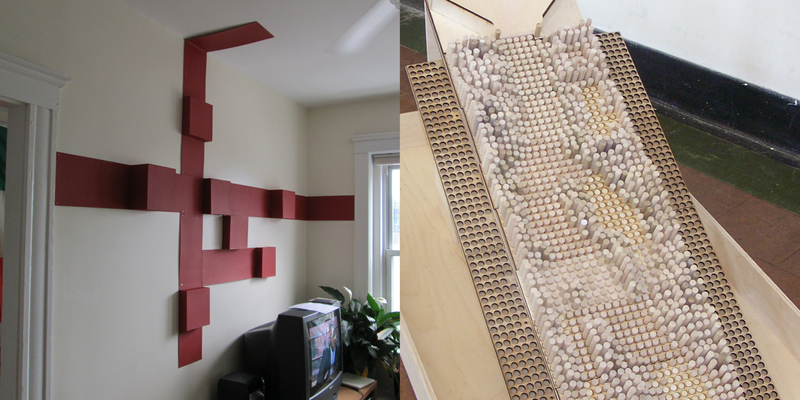 It is a simple and effective way to add dynamism to a flat surface, particularly in architecture. The final item I was really excited about was the framing of certain windows in the façade. By doing so, it helps transform the building into separate entities. No longer is the building one monolithic mass, the framing or segregation of certain windows creates a sense of singular elements being placed on top of others. It is also important to point out that this only works by framing a select few windows; If all the windows were framed they would merge into one another and become a monolithic mass again. Generally speaking I was very pleased by the exterior aesthetics of the building, but it is important to note that architecture is much more than just a visual experience. The most important aspect of architecture is the spatial experience a design can produce. Saying that, I am disappointed to say I could not get inside the locked building. I was however able to look through the glass on the ground floor at what appears to be a combination common space/lobby area. What I saw and what I assume to be a happy accent in the multi-layered reflectivity of the space. It appears looking from the outside that the back windows of the lobby which face the parking lot, have a reflective film applied on the inside. Looking in I could see an initial reflection of myself in the exterior glass along with a secondary reflection of myself along the back wall of the lobby. 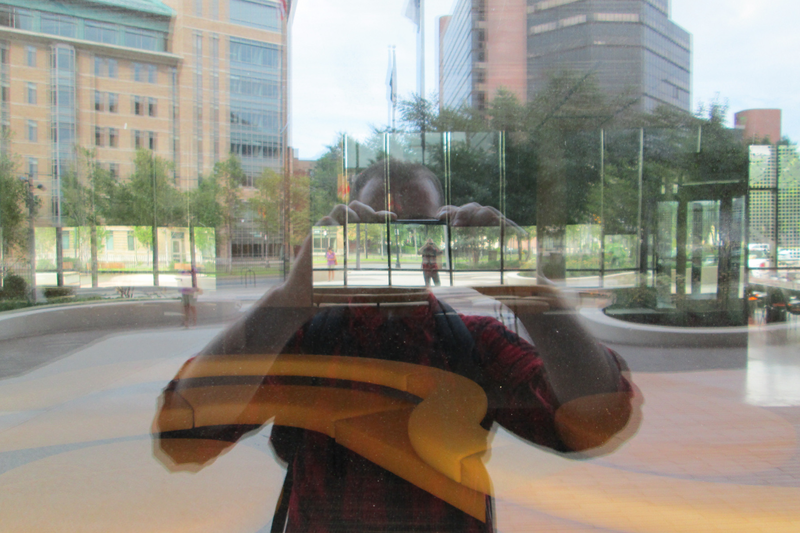 There were reflections of exterior space on top of reflections of interior space, on top of images of the space itself. I don’t know if this kind of visual experience was planned by the architects or not, but either way it made for a very interesting image.